The Launcher is the user interface that displays our device. It determines how applications and widgets are organized on the desktop and we can choose the one that best suits our needs. In the latest Android version, it is very easy to change the launcher. Before Android 4.4 KitKat, we had to go to the settings menu, search for the launcher set as default in the list of applications and change the settings by clicking on “Clear defaults”. 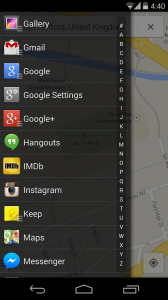 Then, with the button “Home”, Android allowed us to select the launcher wanted among the list of the installed ones. In Android KitKat this task is simplified because in the menu options we found “Home”, where directly appear all launchers installed and we just have to choose the one we want. 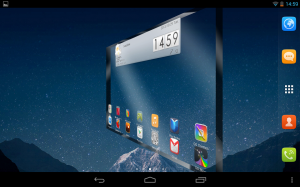 Go Launcher EX is one of the most popular launchers, with many customization options. It has apps, games, themes and wallpapers, and it also offers the possibility to organize all the applications from the same point. 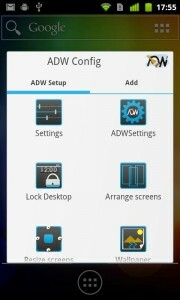 Action Launcher organizes the display through Quickdrawer and Quickpage functions. The first one provides access to the alphabetical list of applications, while the second offers a complete desktop customization. ADWLauncher has a similar style as GO Launcher EX, offering plenty of customization options but without looking so overbearing. It has a lot of free themes and we can easily add apps and widgets to the desktop and organize them into groups. Themer is still in beta version. 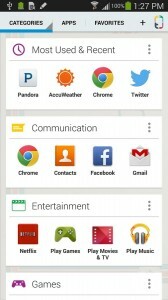 This is a themed interface, where the apps are organized into predefined categories that comes with the selected theme. The themes are free, and there are plenty of them to choose from.